There ought to be room for more things, for a spreading out, like. enclosed street. You can do nothing with them. Not even offer to pay. Making room for more things has involved John Ashbery in a half-century of poetic experimentation. He erodes genre distinctions in the prose works of Three Poems (1972), disintegrates syntax in The Tennis Court Oath (1962), and rewrites traditional forms in Some Trees (1956) and Shadow Train (1981). Dictions mix throughout, and everywhere Ashbery confounds narrative ideology, abandoning the logical map of beginning-middle-end to produce a poetic language whose “endless coming and going,” says friend and poet Kenneth Koch, “itself may be the answer…. [For] this is the experience and the texture (an enchanting and alluring one) of being alive.” It is a paradox, and a very rich one for the poet, that the used medium of language, overlaid as it is with the sediment of history and culture, nonetheless has the power to express what is unknown or unpresentable in a given time and place. Words recombine: the known is breached. The poem fills the space with versions of love and eroticism, with landscapes, people, voices, scenes and situations, whose dimensionality is mysteriously both more and less than what had been. A civilized concern, a never being alone. A spirit of independence reigns. John Ashbery was born in Rochester, N.Y., on July 28, 1927. He grew up on a fruit farm in Sodus, N.Y., near Lake Ontario. He received his B.A. degree in literature from Harvard in 1949 and moved to New York City where he was affiliated with poets Frank O’Hara, James Schuyler, Barbara Guest, Kenneth Koch (the so-called “New York School of Poets”), and painters Jane Freilicher, Larry Rivers, Nell Blaine, and Fairfield Porter. Ashbery completed his M.A. at Columbia University in 1951. He spent the years 1955-1965 in Paris, writing art reviews for The International Herald Tribune and researching an unfinished dissertation on French writer Raymond Roussel. After his return to the U.S., Ashbery was appointed executive editor of Art News, a position he held until 1972. In 1974, he began teaching creative writing at Brooklyn College. Throughout the 1970s and 80s, he continued to write art reviews for Newsweek and New York. His collected art criticism appeared in 1989 in Reported Sightings. Currently, Ashbery is the Charles P. Stevenson, Jr., Professor of Languages and Literature at Bard College. He divides his time between New York City and Hudson, New York. Among the long list of prizes and awards received, a few outstanding mentions: Some Trees (1956) was selected by W.H. Auden for the Yale Younger Poets Prize. Self-Portrait in a Convex Mirror (1975) won the Pulitizer Prize for Poetry, the National Book Critics Circle Award, and the National Book Award; A Wave (1984) received the Lenore Marshall Poetry Prize. 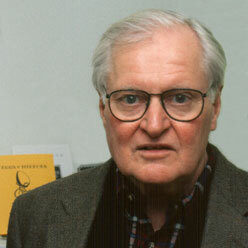 Ashbery was the first English-language poet to win the Grand Prix de Biennales Internationales de Poesie (Brussels). At various times he as been awarded the Bollingen Prize, the Feltrinelli International Prize for Poetry, the Ruth Lilly Poetry Prize, the Shelley Memorial Award, the Frank O’Hara Prize, and fellowships from the Academy of American Poets, the Fulbright Foundation, and the MacArthur Foundation. Ashbery is a Chancellor of the Academy of American Poets. Such is our tremendous luck tonight – that we may sit in hear him read his poems. To each potential reader. Program notes by April Denonno on behalf of the poet’s reading for Counterbalance Poetry on Thursday, October 21, 1999. Broadside created by Paul Hunter/Wood Works Press for the poet’s reading for Counterbalance Poetry on Thursday, October 21, 1999. Printed from hand-set metal type on archival paper with original woodcut. Limited to 162 copies.